Paranal Observatory, Very Large Telescope and the future site of the Extremely Large Telescope, ELT (Cerro Paranal and Cerro Armazones, Chile): Follow astronomers and engineers as they work at the VLT — the largest visible-light telescope in the world — and see how the four Unit Telescopes are operated or maintained. The Paranal Web Cam is an Apical NEOS360. ALMA Observatory (Chajnantor Plateau, Chile): Spot the ALMA antennas as they are being operated by ESO and partners. The camera looks at the Chajnantor Plateau at the Operations Support Facilities near San Pedro de Atacama, Chile. APEX (Chajnantor Plateau, Chile): Watch the Atacama Pathfinder Experiment (APEX) telescope at an elevation of 5100 metres, at one of the highest observatory sites on Earth. La Silla Night Cam: Admire breathtaking night views of the Milky Way from the La Silla Observatory. Rapid Eye Mount (REM) telescope: Four webcams monitor REM at ESO's La Silla Observatory. Danish 1.54-metre telescope: All-sky camera at ESO's La Silla Observatory. Feel free to embed these webcam images on other web pages: just use the URL of the product. The images are produced with a NEOS360 camera by Apical Technologies. The live webcam offers high-resolution views of the Very Large Telescope observing platform. You can zoom in the Unit Telescopes, Auxiliary Telescopes, the VLT Survey Telescope (VST), Cerro Armazones (home of the ELT) and even the distant volcano Llullaillaco (at an amazing distance of 190 km from Paranal). Note that the Moon at times can be so bright that night almost looks like day. Cerro Armazones, home of the future ELT. Note the construction work that is ongoing there. Also note that the Sun rises right behind Armazones as seen from VLT at certain times of the year. K0 station LIVE (11 Sep 2014 15:01 CEST). Here you may be able to see one of the ATs. On extremely clear days the magnificent 6739-metre volcano Llullaillaco is visible in the background of this photograph. It is an amazing 190 kilometres away on the border with Argentina. A1 station. Here you may be able to see one of the ATs. G1 station. Here you may be able to see one of the ATs. On extremely clear days the magnificent 6739-metre volcano Llullaillaco is visible in the background of this photograph. It is an amazing 190 kilometres away on the border with Argentina. Licancabur seen from the Chajnantor Plateau. Here you may be able to see one antenna. Here you may be able to see another antenna. Circular 4k fisheye image for planetarium use. 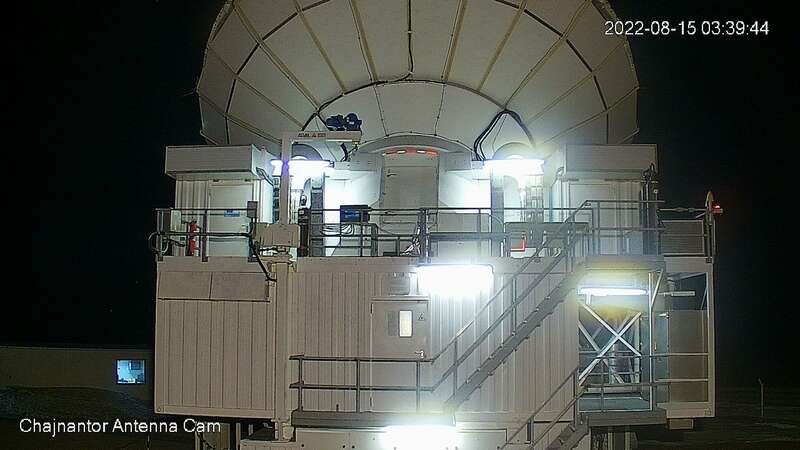 The webcam images of the Rapid Eye Mount (REM) telescope are refreshed every 10 minutes and are maintained by INAF. Please note that during night time these images will be completely dark.